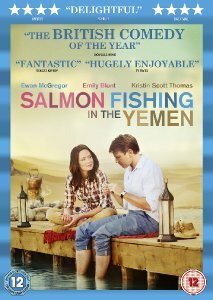 Good British films often seem thin on the ground these days, but thankfully Salmon Fishing in the Yemen is on its way to DVD and Blu-ray this 3rd September, courtesy of Lions Gate Home Entertainment. Adapted by Simon Beaufoy from the best selling book by Paul Torday, this Lasse Hallström directed film stars Ewan McGregor, Emily Blunt and Kristin Scott Thomas. Extras will include a Making Salmon Fishing in the Yemen and The Fisherman in the Middle East: Novelist Paul Torday featurettes. The recommended retail price for the DVD will be £19.99, whilst the Blu-ray will cost £24.99. Fishing expert Fred Jones (McGregor) is approached by workaholic Harriet (Blunt) with a plan to introduce salmon into the waterways of Yemen so her client - the amiable Sheikh Muhammed - can fish there. The seemingly crazy idea attracts the attention of the British government who hijack it with a view to creating a positive story about the Middle East. Despite Fred's protests he soon finds himself working on a project that seems not only frivolous but absolutely unfeasible in the arid land of Yemen. His scepticismis matched only by the sheikh's boundless optimism. As the bizarre mission begins, they soon find that hope can spring - even in the most unexpected places!